M48 Kommando Talon Survival Spear | BUDK.com - Knives & Swords At The Lowest Prices! 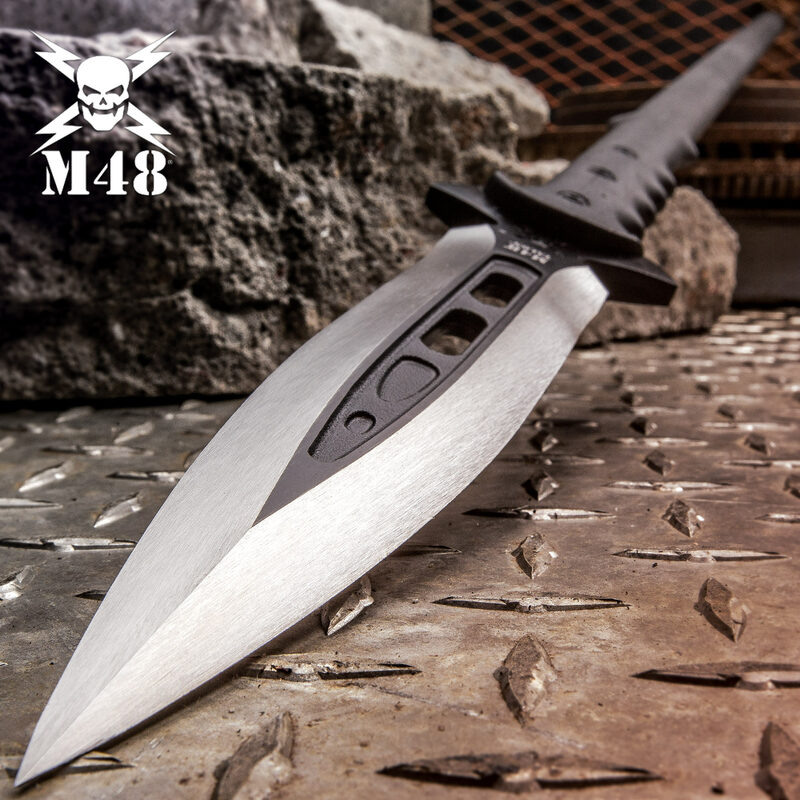 This M48 Survival Spear from United Cutlery measures in at a whopping 44 1/8" from end to end, featuring a razor-sharp blade that is nearly half an inch thick! 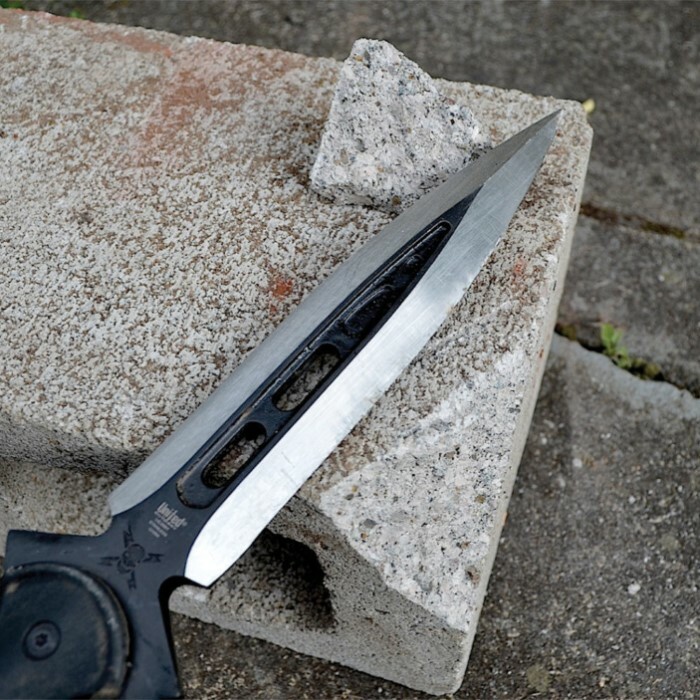 With a stainless steel blade this powerful, this spear was built for durability and strong use. 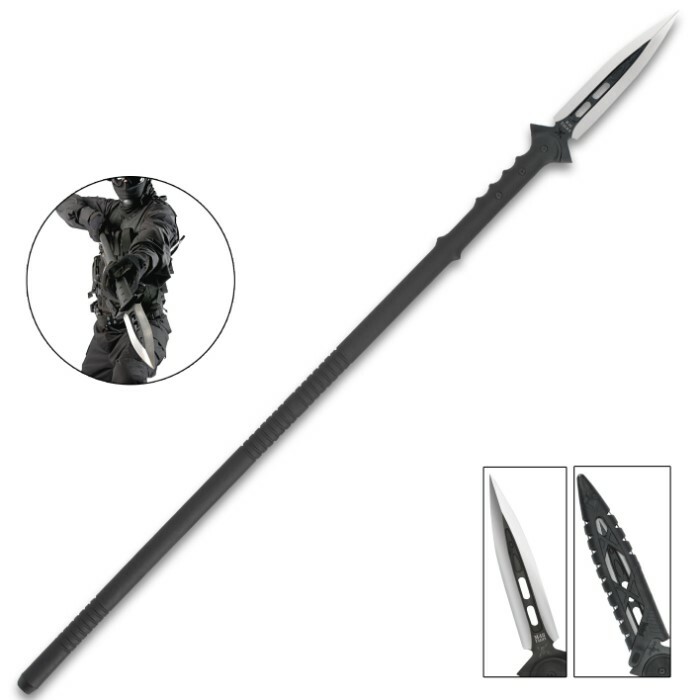 Practical applications abound with this massive spear, including uses such as breaching, prying, and impaling practically anything. Stop trying to slice things! I read many of these so-called reviews, and may I just say as an expert spearhunter, most of you are morons. This is not a weapon designed to slice, it's designed to penetrate (like a f*****g spear)! If you want a long polearm style weapon that can slice like a sword without breaking or bending etc. then buy a Japanese Naginata. Otherwise, this spear will perform excellently as described. Stop being dumb. This spear is spectacular very durable and very shard would recommend. I bought this for myself and was great-threw it at pineapple an tree and works very well. but do not do what it is not designed for. My older son wanted to borrow it for a camping trip with himself and some buddies. Apparently this is not a axe because a overhead, downward thrust with two hands to cut threw a ham bone is to much for the handle it snapped off right below where the blade ends. I was very happy with the item, but use outside of its design can cause serious or death, if you are swing at a tree or pole and miss and hit the handle, which I did not know was able to just snap off under stress. Still loved the item, and trying to redesign into a knife or convert into a more sturdy spear handle. 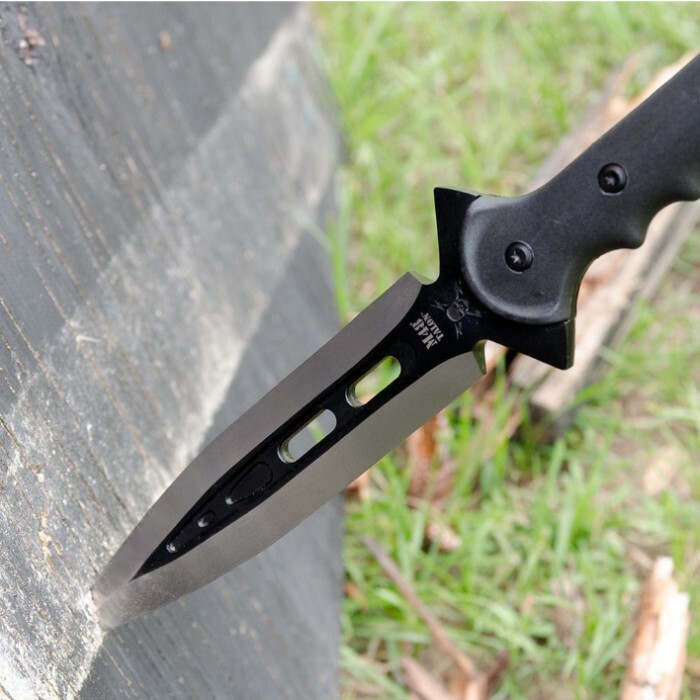 This blade is awesome! I tore apart my archery target and was even able to throw it across the room and hit my mark!! Cut clean through the top of my shoe pulling it out of my target (accidentally of course) This is a serious weapon! Well built and sturdy and a definite recommend to friends!! 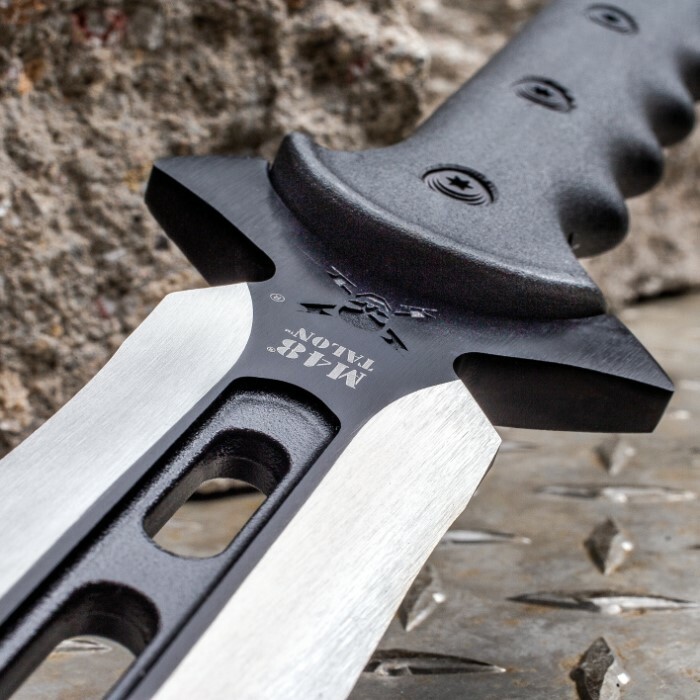 "Spear designed for law enforcement".... Since when would any law enforcer use a spear. I bought it felt sturdy,but when I tried to cut some cutzoo vines,the blade not only got so dull but it developed nicks in the blade LIKE its the cheapest steel they found to make this spear,And it would never chop a block like it shows in the picture cause the spear would break an completely destroy the edges.